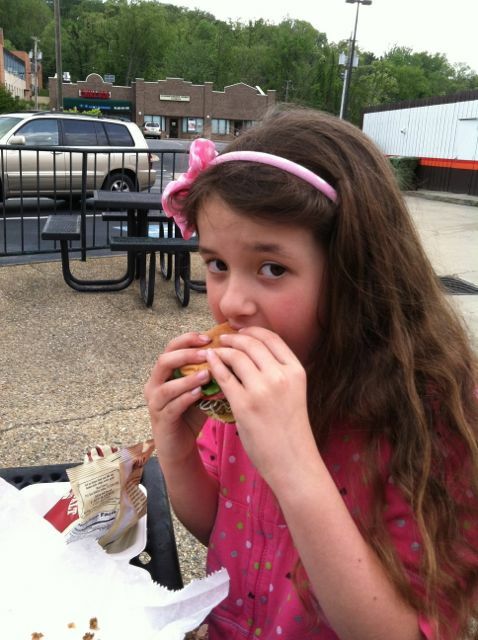 Normally going to a fast food restaurant is not an option for my family. There really are days though that I would just love to be able to go to a drive thru for a quick meal that I don’t have to cook. I found the perfect place in Asheville, NC. It is VegHeads Drive Thru. The food was amazing and the prices were reasonable. It is probably good that we live over and hour away or I amy go there more than I should. This is the mountain Burger that my husband had. It was delicious! He had seaweed cucumber salad on the side. Kind of a weird combo, but he was happy. My daughter has the mini mountain burger from the kids menu. It was really cute. I had a baked falafel wrap, which was unbelievable, with tabbouleh on the side. The falafel was baked instead of fried, so it wasn’t greasy at all. 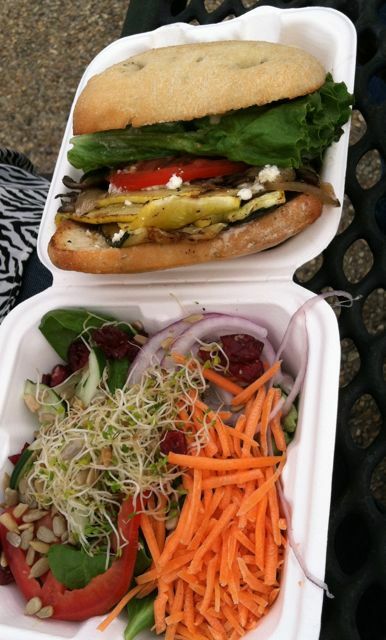 This is the Veggie Stack that my Mom had. It is not actually vegan because of the feta cheese and the bread, but my Mom said it was delicious. 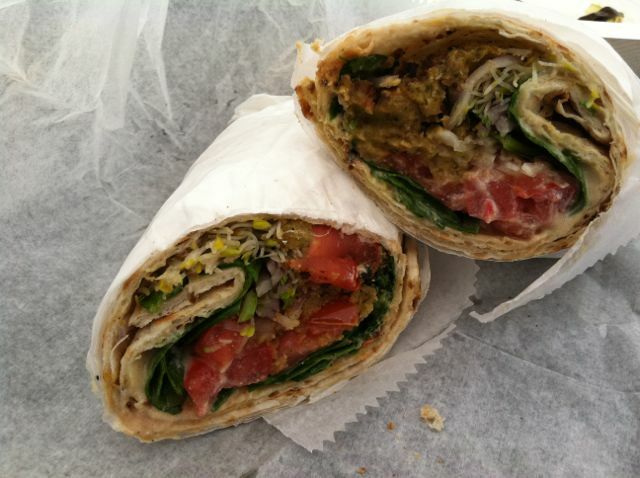 Falafel is one of my favorite foods. This variation on the regular falafel turned out to be equally delicious. 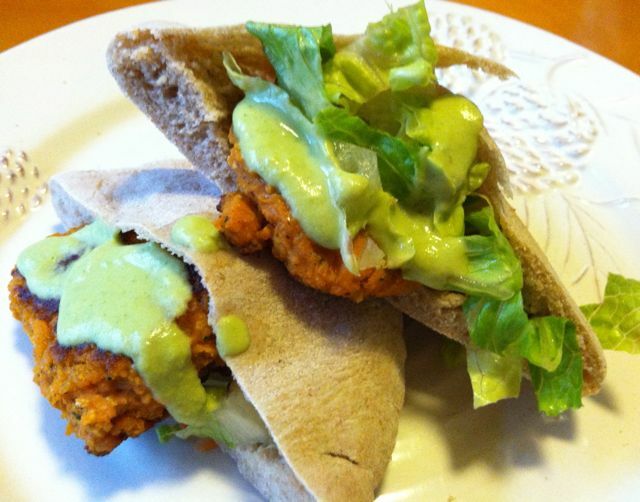 The sweet potatoes give the falafel a completely different texture then the original and they add great flavor. The outside gets nice and crispy and the middle is very creamy. Serve it with warm pita and tahini sauce. Bake the sweet potatoes at 400 degrees until tender (about 20-30 minutes). Let the potatoes cool and then remove the skin, it should just peep off. Set aside. Add the garlic into a food processor and finely chop it. Add in the sweet potatoes, parsley, coriander, cumin and salt. Process it until the potatoes are mostly smooth. Add in the chick peas and pulse it until the chick peas are mostly chopped, you want it to still have some texture. Put the mixture into a large bowl and add in the chick pea flour and the bread crumbs. Mix it thoroughly. Heat the oil in a large skillet or on a griddle over medium high heat. Put the falafel mixture in the hot oil by the heaping tablespoons and press them down a little. Cook on each side for 4-5 minutes until the falafel are a nice golden brown and crispy. 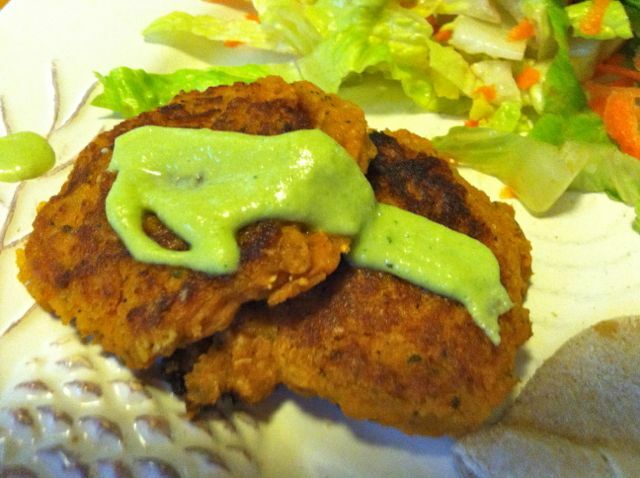 Serve the falafel with the tahini sauce and warm pita. Add all of the ingredients into a blender and blend until sooth. Start with 3/4 cup water and add more as needed. You want it be a little thick, but still pourable. I love to bake my own bread and pita is my favorite I think. There is nothing better than the smell of warm bread coming out of the oven. 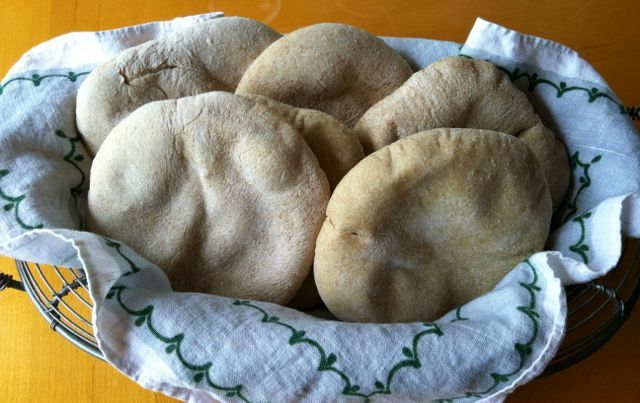 Pita takes a little practice to make, but it is well worth the effort. 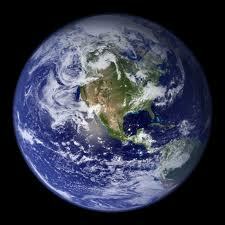 Earth Day is April 22nd and it is a great time to think about ways we can be kind to our planet. My kids decided that they want to pick up all the trash around our house for Earth Day. Even though we live in the mountains, there is an unbelievable amount of trash left on the roads near our home. Here are a few things that you can do on a daily basis to help conserve our resources. 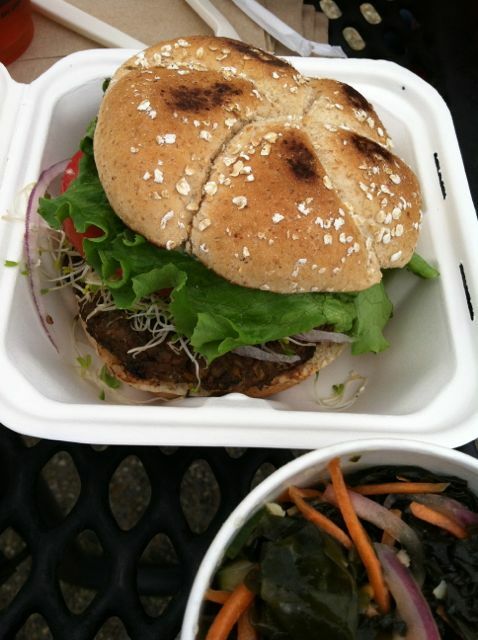 Following a plant based diet makes a huge positive impact on the environment. Raising livestock creates a lot of pollution and meat production uses a huge amount of water. It takes about 2500 gallons of water to produce 1 pound of meat. Eating plants uses only a fraction of the water. Recycle what ever you can. Most of us are really good about recycling our trash, but try to find ways to recycle or upcycle all your unwanted items. Donate all your old clothes, electronics, sports equipment and other useable household items. Reuse as much as you can. Also, try to buy products that contain recycled materials. Buy used whenever you can. Buying something used saves resources and saves you a lot of money as well. There are tons of great consignment shops and thrift stores everywhere now. All the little things we do each day really add up, so just making small changes makes a big impact and creates hope for our future! 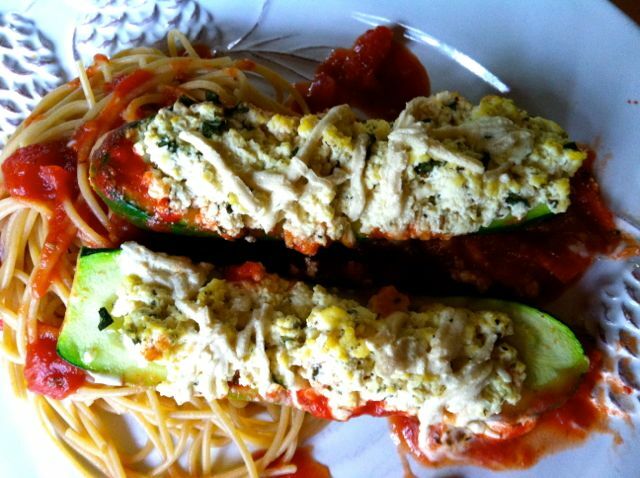 I stuffed this zucchini with tofu ricotta and Daiya Mozzarella, then baked it over tomato sauce. It was served over whole wheat spaghetti. The zucchini gets really tender while it’s baking and goes great with the flavor of the ricotta and tomato sauce. It also makes a very nice presentation, so it would be great for serving to company. Preheat the oven to 375. Pour the pasta sauce into a large baking dish and cover the bottom with the sauce. Cut the stem off the zucchini and then cut in half lengthwise. Using a teaspoon scape all the seeds out of the zucchini to make a space for the ricotta. Just be careful not to get to close to the skin on the sides and bottom. Add the basil into the tofu ricotta and mix it well. Fill the zucchini with the ricotta and lay them on top of the sauce. When they are all filled sprinkle the zucchini with the Daiya. Bake for about 30 -40 minutes until the zucchini are tender but not mushy. Serve over whole wheat pasta. Combine all of the ingredients and mash them together. I like to use a potato masher for this. It should have the texture of ricotta cheese when it is mashed. Let is sit in the fridge for at least 30 minutes before you use it. 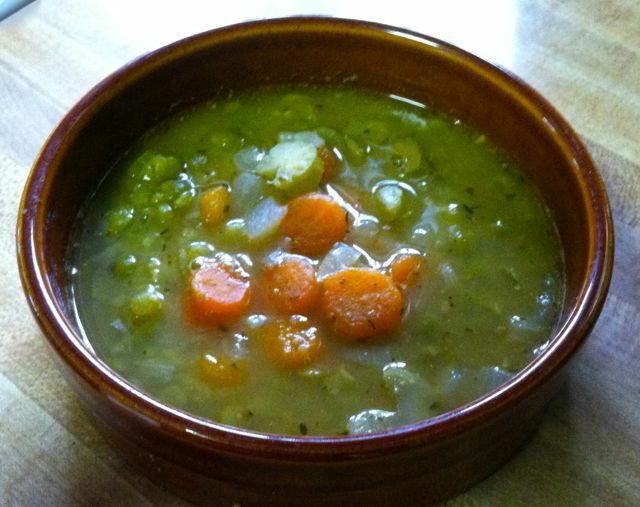 Split pea is one of my families favorite soup. It also happens to be really easy to make and really inexpensive. Split peas are only about $1.00 per bag. I usually double the recipe so I have lots of leftovers for lunch the next day. You can leave the soup chunky or blend it to make it creamy. This soup can also be made in the crock pot. Just throw in all the ingredients and let it cook on low all day. Stove top method: Heat the oil in a large soup pot over medium heat. Add the onion, carrots, celery and garlic to the pot and cook for 10 minutes, stirring frequently. Add in all the remaining ingredients and bring to a boil. Reduce the heat and simmer the soup for 45 minutes -1 hour. Remove from the heat and blend for a smooth and creamy soup or leave chunky. Crock pot method: Add all the ingredients to the crock pot and cook on low for 6-8 hours or on high for 3-4 hours. I just have to say that tofu is not something that I usually like, in fact I really dislike it. If something tastes like tofu, I don’t eat it. This does not taste like tofu. My kids share my feeling about tofu and they gobbled this up. It has a sweet and salty flavor to it and it gets a little crisp under the broiler. I served it with sautéed kale and brown rice, but it would be great on a salad as well. Just make sure you let your tofu drain really well. You want as much water out of it as you can get, so it can absorb more of the marinade. I put my tofu in a strainer and then put a small plate on top of it, then put a heavy jar on the plate to help press out the water. Combine the soy sauce, vinegar, ginger, garlic, syrup, and sesame oil in a bowl and mix it well. Once the tofu is drained slice it into 1/4 inch slices. Place the tofu slices in a large flat dish (like a pyrex dish), so the slices are in a single layer. Pour the marinade over the tofu. Let it marinate for at least 30 minutes, turning it once (the longer it sits in the marinade the better). Turn the broiler on high. 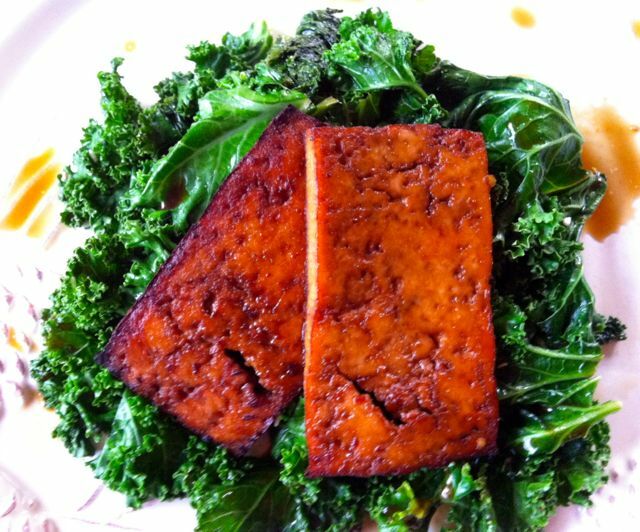 Place the tofu on a lightly oiled baking sheet and broil it for 10 minutes and then turn it over. Broil it for 5-8 minutes on the other side. Just watch so it doesn’t start to burn. It should be very well browned with slightly crispy edges when it is done. Pout the remaining marinade into a small sauce pot and bring it to a boil. Turn off the heat. Serve it over the tofu. It is also great on brown rice and greens. This is what I served for our Easter dinner, but it would be great for any special occasion or holiday. 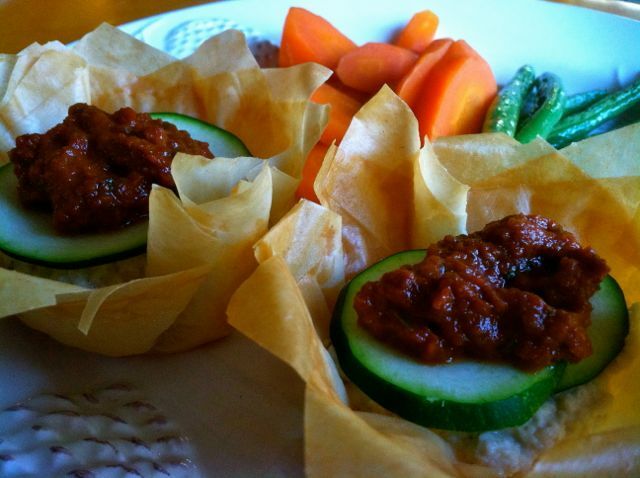 The phyllo cups make a very elegant presentation, but really are not difficult to make. Phyllo can be a little tricky the first time you use it. Just remember to keep the phyllo covered with a damp towel and you should have no problems. The filling is mostly raw so there is not a lot of cooking time and a lot of it can be made ahead. The cashews and the sun dried tomatoes need to be soaked for a few hours at least, or overnight, before you start to prepare them though. After all the treats we had around Easter, it was nice to enjoy a nice light dinner. I had a lot of the fillings left over, so I blended the ricotta and the tomato sauce together and served it over whole wheat pasta the next day. After soaking the cashews, put all the ingredients in a food processor and blend together until it is mostly smooth. You want it have a little texture left. Put in a bowl and set aside until your cups are ready. After soaking the tomatoes, put all the ingredients in a food processor and blend together until it is mostly smooth. Add the water a little at a time until you get a thick sauce. Put in a bowl and set aside until your cups are ready. Preheat the oven to 375. Spray a 12 cup muffin pan with cooking spray or lightly butter it. Open the package of phyllo on a cutting board and place a damp towel over it until you are ready to start. Cut the phyllo into 4 X 4 squares and cover with the towel again. Take 4 sheets of the phyllo out (keep the rest covered) and lightly brush the first with Earth balance, make sure to get all the way to the edges. Lay another sheet on top at a slight angle and brush with butter. Repeat with the next 2 sheets. Make sure you place them at different angles. Lightly press the phyllo into a cup in the muffin pan. Repeat this until all 12 cups are filled with phyllo. Bake the phyllo cups about 8 minutes. Check them frequently because they can burn quickly. The cups should be a nice golden brown when they are done. Let the phyllo cups cool for a few minutes and then remove them from the pan. Put a heaping tablespoon of the cashew ricotta in the bottom of each phyllo cup. Top the ricotta with a few zucchini slices then put in a few teaspoons of the sauce. After weeks of warm weather we have had a few cold days here in North Carolina, so I wanted something warm and filling. I also have been craving curry, so this dish was perfect. Curry is one of my favorite things to eat. I love all the bold flavors and the spice. For this curry, I roasted the veggies, put in some chick peas and I served it over brown rice. Preheat the oven to 400. 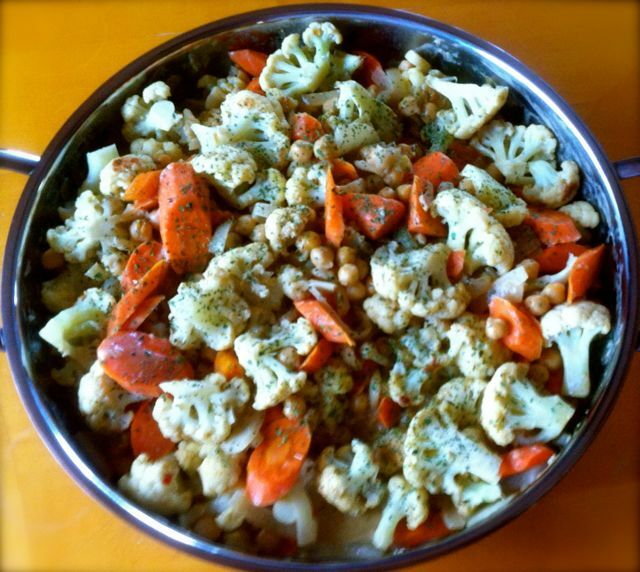 Cut the cauliflower into small florets and chop the carrots into 1/2 inch slices. Coat the veggies in about 2 Tbsp of the oil and put them on a sheet pan. Roast the veggies for about 20 minutes until they are tender. While the veggies are roasting start the sauce. In a large skillet heat the remaining Tbsp of oil. Add in the onion and sauté for about 5 minutes. Add in the garlic and fresh ginger if you are using it, then cook another minute. Pour in the coconut milk, the broth, ground ginger, curry powder and salt. Simmer for 10 minutes. When the veggies are finished roasting, add them into the curry sauce with the chick peas. Simmer for another 5 minutes. Stir in the cilantro into the curry if you are using it. Serve the curry over brown rice. The kids the call this monster soup because of the green color the broccoli gives it. The cauliflower makes this soup very creamy and potatoes give it some richness. It is a great way to get lots of veggies in kids without them realizing it. This recipe makes a really big pot of soup, but you can always freeze the leftovers or have it for a quick lunch during the week. Heat the oil in a large pot and add in the onion. Sauté the onion for about 5 minutes. Add in the broccoli, cauliflower and potatoes. Cook for a few more minutes and then add in the broth, salt and pepper. Simmer for about 30 minutes until all the veggies are very tender. Stir in the yeast and cook another couple of minutes then remove it from the heat. 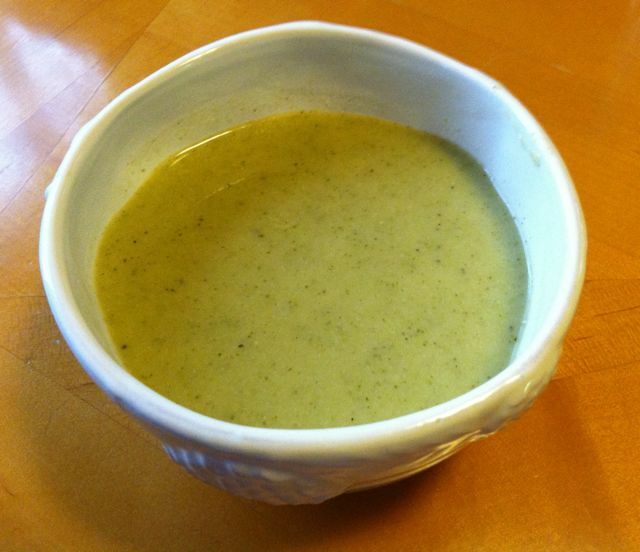 Blend the soup using an immersion blender or in small batches in a standing blender. Once the soup is blended stir in the soy milk (do not let the soup boil once the milk is in).